What do you look forward to after the winter blues? Spring Training! 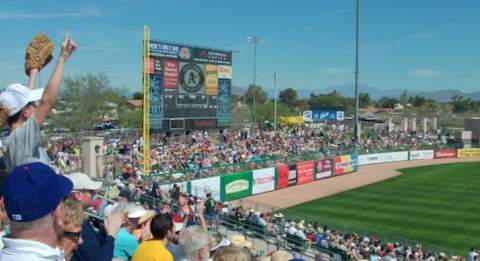 Hohokam Park in Mesa used to be the home of the Chicago Cubs every spring! 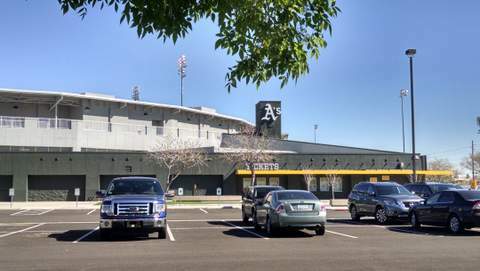 Now its the spring training home to the Oakland Athletics. The Cubs have moved to the new Sloan Park. The new address is 2330 W. Rio Salado Parkway in NW Mesa. Click here to see that page. Spring is the time of year that Arizona is the envy of the planet for sunny days. Trees are starting to green up and the smell of cut grass brings back good memories. It sure beats the gray bleakness of parts of the country locked in a freezing winter. The sun feels warm on your skin and the air is still cool-most of the season. Just in case bring a light jacket and hat to the game because the low sun can place you in the shade. And when there are cool gusts you will appreciate the warmth of an extra jacket. Then some days can be scorchers if your seat is in the sunny bleachers. So bring some sun screen and a hat. 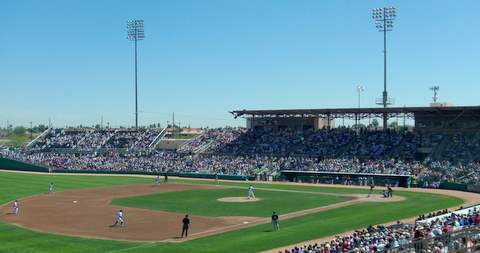 You will notice the Hohokam Park shade seats are terrace box seats in the upper levels. This is a good thing when it's hot. 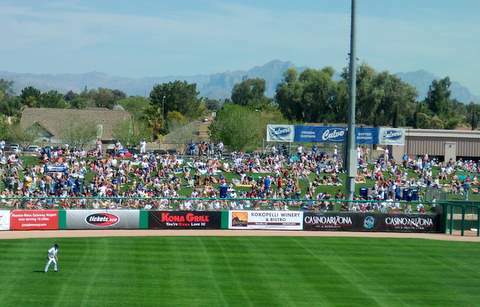 The Hohokam Stadium has a bright green grass field with plenty of seats to watch the action up close. There are seats in the bleachers, box seats, and soft grass berms in the outfield. There are no “nose bleed” seats and you really can watch exciting live baseball instead of gawking at a monitor. The people of the City of Mesa invested a lot of money in this stadium so if you want to do your part just go to some games! Just think, you are doing your civic duty by going to baseball games! An afternoon game is like a Ferris Bueller day off. "Life goes by pretty fast." You can start your day off looking at art just like the movie. Say, would you like a suggestion for an art museum? Check out one of the these museums. The first game generally starts in late February to March. Games typically start at 1:05 PM Arizona time. See link at the bottom of this page for all games. Are there any good restaurants nearby Hohokam Park? 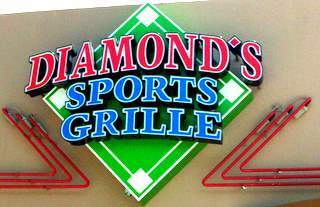 Which was renamed to Diamond's Sports Grille. Many games are sold out and the parking can be crazy. Leave early and then get there early. Traffic delays are normal before the games because spring training is so popular. Parking seems to be adequate and there are plenty of helpful people who will guide you into your parking spot. Here's a view of Hohokam stadium from the parking lot. Ever wonder where the word "Hohokam" came from? It is the name for the industrious prehistoric people who lived here and vanished. The word comes from the Pima language and means "vanished ones." You can see the remnants of the Hohokam irrigation canals right around the block at the Park of the Canals. For general baseball info see the Hohokam Stadium site. Phone is (480) 644-4451.